Are you hard on your rubber duck? Recently, the US Forest Service pulled all their HT antennas from the fire line at the end of the season and had them tested. They were new at the start of the season, but at the end of the season, 60% of them failed testing, and had to be replaced. Personally, between my day job and my recreation, I damage about 3 ducks a season. Not being as pedantic as my 'mentors', the damage is caused from either being in a hurry, or not paying attention while carrying my radio on my duty belt, or stuffing the radio into my pack or saddlebag with the antenna still attached. I may be lucky because the incomparable folks at Smiley keep me well provided for, but we decided we really needed antennas are reinforced (like Smiley does for the US Marines) for use in extreme conditions such as those encountered by AT Skiers and First Responders, but who may still need to use a Rat Tail in the backcountry. The IPX6 is our own aftermarket, value-added, solution to this problem. As such, it is overbuilt and over priced for recreational or HAM use. This design addresses the problem encountered by many of our specialist users who damage their antennas by bending them to the point where they are kinked. If your antenna looks like the one on the right (notice there is a 30 degree kink right at the base), it is EOL just like those USFS antennas (end of life). So introducing the IPX6. This antenna has become the Gold Standard for a majority of commercial cat and heli ski operators, guides, and SAR teams. The IPX6 design allows for the use of the Rat Tail and changing the base out, but it can also be sealed at the base with a shroud for maximum resistance to dirt and moisture. It is water resistant to beyond an IPX6 rating, and is meant to resist getting bent and kinked. It is our standard 5/8 wave SAR center tuned antenna, reinforced with overlapping single wall polyolefin tubes. This series uses adhesive lined double wall tubes. With a dull surface, it has a rubbery tactile feel. It is designed to allow for some flex without cracking and continues to flex in the cold. 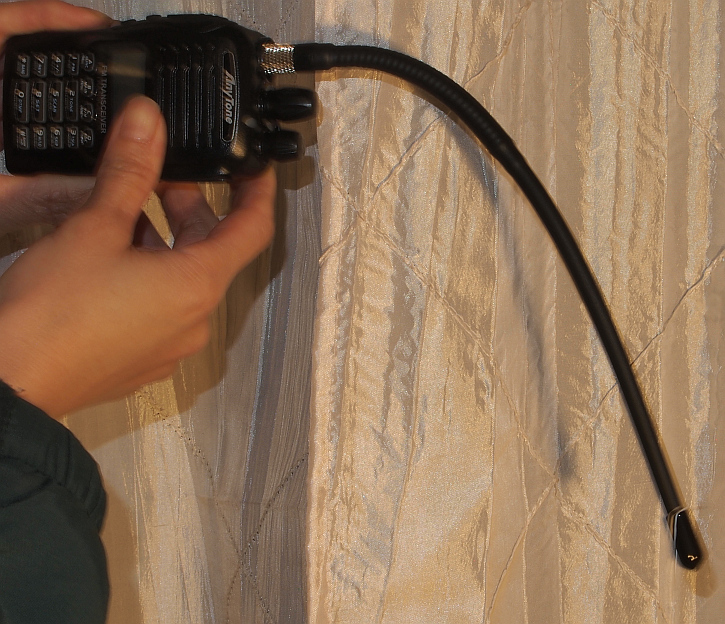 If you want to have a heavy duty antenna, but use the Rat Tail or swap out base connectors, then you must let us know when ordering so we can supply the antenna with a base that can be unscrewed (this design is not as waterproof). The tubing we use on these antennas affects the velocity factor (the velocity factor of a coax cable is the speed an electromagnetic wave travels along a coax cable relative to the speed in a vacuum. In these antennas, it is affected by the dielectric that is used within the coax cable and the tubing, and this has the effect of slowing the signal down.) 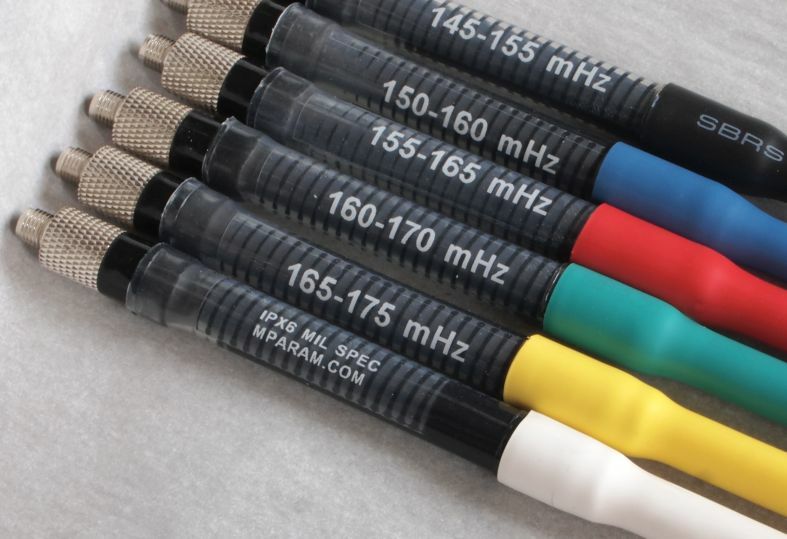 Normally, if resonant lengths of RF coax cable are to be used, then it is necessary to know the velocity factor of the coax cable. It is often possible to determine this to a sufficient degree of accuracy from a knowledge of the dielectric material. And although we know that the velocity factor of our tubing is about .695, we have instead tested the antennas for optimum tune by measuring Standing Wave ratios and forward and reflected power, and then tuning the antennas to length accordingly. This substantially mitigates the effects the velocity factor presents to this antenna design. Tuning based on SWR and power ratios has also resulted in the IPX6 antennas being slightly shorter in length than the stock Smiley 5/8 wave ducks at the same center tuned point. At the thickest part (where the stem flares over the coil) the IPX6 is 5.1mm and weighs 44g (for the 145-155 model), the standard S&R is 3.3mm and weighs 34g. The stock antennas are made in the USA by Smiley. We tweaked the design so we could color code and print the frequency range of each antenna under the dual wall tubing. We had to find a source for the dual wall tubing that could supply all the colors, plus the transparent, and buy it in rolls from Asia. We hand tune each antenna to the specific frequency, and then have to apply the tubing sections and labels: three separate stages in all. The dust skirt on the bottom (for SMA-M bases) then has to be trimmed by hand. The total labour time is about 10 minutes per antenna. The cost for the standard Smiley is $23.00. The cost for the IPX6, when bought in 3 packs, is about $10.00 more. The cost for the additional IPX6 materials is roughly $3.00. That equates to us making less than $45.00 per hour for the time we spend making these antennas. Last time you had a mechanic work on your car, or a plumber fix your pipes, what did they charge per hour? * There is no performance increase between the stock Smiley and the IPX6. The latter are more rugged, the color coding and labelling make selection easier, and the recent addition of a reflector band at the base makes them easier to find at night, especially if the radio is lost on the ground. If you are a recreational user that does not place rugged demands on your gear, then the IPX6 might be more antenna than you need and the stock Smiley will work fine for you. Antennas can be special ordered with your own color codes, requires an additional $10.00 setup fee per order. The most common question we get with respect to these antennas is, "which one do I choose?". The answer is dependent on the frequency you plan to use. 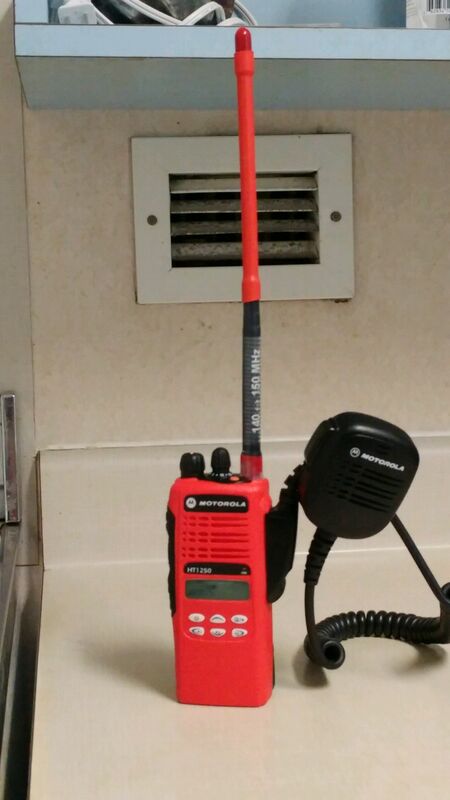 If you only use on frequency in your radio then you get one antenna tuned to that frequency. If you have 100 VHF frequencies in your radio, and some more UHF frequencies, then you need 3 VHF antennas, and one UHF antenna. For more information on why this is, please refer to this page. The Smiley core we use has a two-part base connector. The bottom is metal, and onto that is attached a plastic collar. On the IPX line of antennas, the clear CPC Tubing that encapsulates the loaded coil overlaps the plastic part by about 2mm. There is a small glue bead that extrudes onto the connector. This is left in place post-purchase to enhance water resistance for users who do not use a Rat Tail. 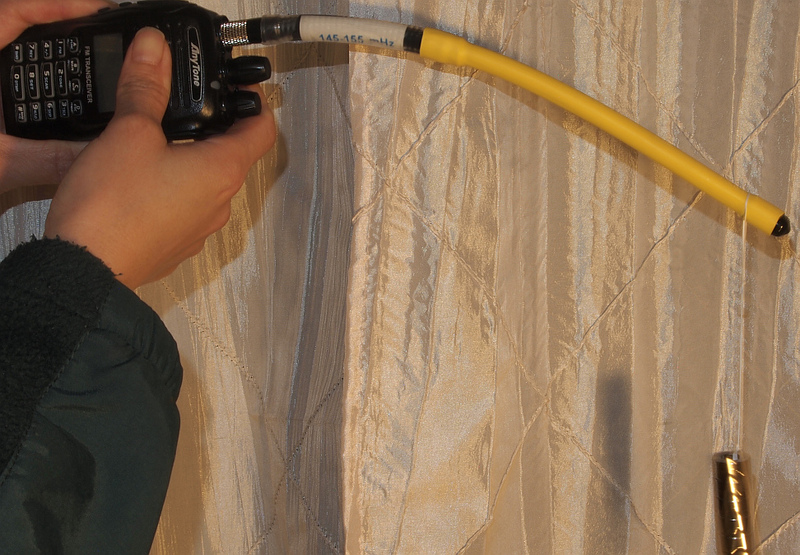 The first time an IPX6 is used with a Rat Tail, the user must break the bead in order to unscrew the connector and substitute the Rat Tail. 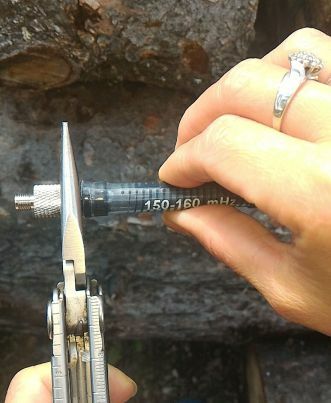 This is easily accomplished by grasping the antenna firmly on the clear tubing, and then breaking the bead with the pliers on your leatherman clamped onto the plastic part of the base connector as in the image below. (Turn the black plastic collar clockwise). If you order a Rat Tail, and you wish us to do that pre-sale, just send a note when you order and we can do it. The IPX6 has become our most popular model, outselling the standard 5/8 wave by 5 to one. The reason is because most of our clientele are hard on their antennas, and, like the Navy Seals this model was originally designed for, they cannot afford to have equipment failure in the field. - It seems like your 'ugly duck' is carving a reputation as the estoteric tool for the advanced guides, and therefore earned it's place in our gear quiver. I suppose, based on the cult status it has apparently given us, it is becoming a status symbol, and has already paid for itself many times over." -W.W.